Later, when the moderator asked why Putin would respect a Trump-Pence administration, Pence answered: “Strength.” Kaine, unable to restrain himself, blurted out: “Business deals.” His smirk betrayed his conviction that he had just scored points, even though the moderator had to instruct him — for the third time, at least — to wait until it was his turn to speak. Pence also beat Kaine over the head with the Russian “reset,” Clinton’s email scandal, and the Clinton Foundation. Moderator Elaine Quijano of CBS News stepped in to protect Kaine, especially when it came to the email scandal (though, to her credit, she at least asked about it, unlike NBC News’ Lester Holt in the first presidential debate). There was nothing in Tim Kaine’s performance that showed he could act like a president. Pence aced that test. Now the hard questions for Hillary will begin. Mike Pence and Tim Kaine face off at Longwood University in Virginia for the only vice-presidential debate of 2016. How Running Mates Influence Home State Voting in Presidential Elections," said the debate was not likely to change many minds, even as voters had an extended chance to see both candidates in action. Republican Mike Pence and Democrat Tim Kaine tonight met for the first and only vice presidential debate of the 2016 campaign, where they worked to defend the records of their running mates -– Donald Trump and Hillary Clinton. The Republican National Committee (RNC) appeared to accidentally declare on its website Tuesday night that Mike Pence was the winner of the vice presidential debate, nearly two hours before it was slated to start. 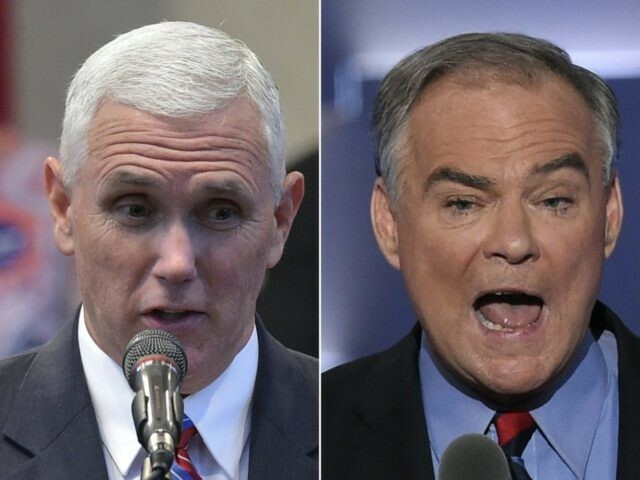 Vice presidential candidates Tim Kaine and Mike Pence were defensive out of the gate Tuesday night and didn't let up for 90 minutes, interrupting each other and throwing attacks against Democrat Hillary Clinton and Republican Donald Trump — and at times each other. In a presidential race where Hillary Clinton has sought to disqualify Donald Trump over his “temperament,” running mate Tim Kaine is facing mounting fallout over his own demeanor at Tuesday night’s first-and-only VP debate – where the Virginia senator frequently interrupted not only Mike Pence but the moderator. For one night, Mike Pence put a calmer, gentler face on the 2016 Republican ticket. And Tim Kaine's pestering style helped him do it. But the Indiana governor's big night in Tuesday's vice presidential debate might not transfer to his running mate, Donald Trump. With just five weeks left until Election Day – and at least a dozen states already collecting early ballots – Donald Trump and Hillary Clinton’s right-hand men faced off Tuesday in the one and only vice presidential debate this election season. The 90-minute event featured Indiana Gov. Mike Pence and Virginia Sen. Tim Kaine and took place at Longwood University in Farmville, Virginia. CBS News correspondent Elaine Quijano moderated. FARMVILLE, VA. Republican Mike Pence and Democrat Tim Kaine have arrived at the site of the first and only vice presidential debate. The candidates will face off just past 9 p.m. at Longwood University in Farmville, Virginia. As VP nominees Governor Mike Pence (R-IN) and Senator Tim Kaine (D-VA) face-off Tuesday evening at Longwood University in Farmville, Virginia, Breitbart will provide live fact-checks of their debate. Stay with us throughout the evening as we update this livewire to correct the record. Republican Mike Pence and Democrat Tim Kaine have arrived at the site of the first and only vice presidential debate. The candidates will face off just past 9 p.m. at Longwood University in Farmville, Virginia. Virginia Sen. Tim Kaine and Indiana Gov. Mike Pence met face-to-face for the first time Tuesday night, as the running mates took part in the only vice-presidential debate of the 2016 election. The debate came amid Kaine and Hillary Clinton's newfound momentum in the race and as the Trump-Pence campaign continues to find itself on its heels -- due to a poor Trump debate performance last week and basically everything that has happened since. We've posted the complete transcript below, along with our annotations of the key moments, fact checks and other commentary. To see an annotation, click on the highlighted text. To make your own annotations, make sure you have a Genius account. QUIJANO: I'm Elaine Quijano, anchor at CBSN, and correspondent for CBS News. It's an honor to moderate this debate between Senator Tim Kaine and Governor Mike Pence. Both are longtime public servants who are also proud fathers of sons serving in the U.S. Marines. The campaigns have agreed to the rules of this 90-minute debate. There will be nine different segments covering domestic and foreign policy issues. Each segment will begin with a question to both candidates who will each have two minutes to answer. Then I'll ask follow-up questions to facilitate a discussion between the candidates. By coin toss, it's been determined that Senator Kaine will be first to answer the opening question. QUIJANO: We have an enthusiastic audience tonight. They've agreed to only express that enthusiasm once at the end of the debate and right now as we welcome Governor Mike Pence and Senator Tim Kaine. QUIJANO: I'd like to start with the topic of presidential leadership. Twenty-eight years ago tomorrow night, Lloyd Bentsen said the vice presidential debate was not about the qualifications for the vice presidency, but about how if tragedy should occur, the vice president has to step in without any margin for error, without time for preparation, to take over the responsibility for the biggest job in the world. What about your qualities, your skills, and your temperament equip you to step into that role at a moment's notice? Senator Kaine? I am so proud to be running with another strong, history-making woman, Hillary Clinton, to be president of the United States. I'm proud because her vision of stronger together, building an economy that works for all, not just those at the top, being safe in the world not only with a strong military, but also strong alliances to battle terrorism and climate change, and also to build a community of respect, just like Barbara Johns tried to do 65 years ago. That's why I'm so proud to be her running mate. Hillary told me why she asked me to be her running mate. She said the test of a Clinton administration will not be the signing of a bill or the passage of a bill. It'll be whether we can make somebody's life better, whether we can make a classroom better learning environment for schoolkids or teachers, whether we can make a safer -- it's going to be about results. And she said to me, you've been a missionary and a civil rights lawyer. You've been a city councilman and mayor. You've been a lieutenant governor and governor and now a U.S. senator. I think you will help me figure out how to govern this nation so that we always keep in mind that the success of the administration is the difference we make in people's lives. And that's what I bring to the ticket, that experience having served at all levels of government. But my primary role is to be Hillary Clinton's right-hand person and strong supporter as she puts together the most historic administration possible. And I relish that role. I'm so proud of her. KAINE: I'll just say this: We trust Hillary Clinton, my wife and I, and we trust her with the most important thing in our life. We have a son deployed overseas in the Marine Corps right now. We trust Hillary Clinton as president and commander-in-chief, but the thought of Donald Trump as commander-in-chief scares us to death. PENCE: Well, first off, thank you, Elaine, and thank you to -- thank you to Norwood University for their wonderful hospitality and the Commission on Presidential Debates. It's deeply humbling for me to be here, to be surrounded by my -- my wonderful family. And, Senator Kaine, it's an honor to be here with you, as well. And I just -- I also want to say -- I want to say thanks to everyone that's looking in tonight, who understands what an enormously important time this is in the life of our nation. For the last seven-and-a-half years, we've seen America's place in the world weakened. We've seen an economy stifled by more taxes, more regulation, a war on coal, and a failing health care reform come to be known as Obamacare, and the American people know that we need to make a change. And so I want to thank all of you for being -- being with us tonight. PENCE: I also want to thank Donald Trump for making that call and inviting us to be a part of this ticket. I have to tell you, I'm a -- I'm a small-town boy from a place not too different from Farmville. I grew up with a cornfield in my backyard. My grandfather had immigrated to this country when he was about my son's age. My mom and dad built a -- everything that matters in a small town in Southern Indiana. They built a family and -- and a good name and a business. And they raised a family. And I dreamed some day of representing my home town in Washington, D.C., but I -- honestly, Elaine, I never imagined -- never imagined I'd have the opportunity to be governor of the state that I love, let alone be sitting at a table like this in this kind of a position. So to answer your question, I would say I -- I would hope that if -- if the responsibility ever fell to me in this role, that I would meet it with the way that I'm going to meet the responsibility should I be elected vice president of the United States. And that's to bring a lifetime of experience, a lifetime growing up in a small town, a lifetime where I've served in the Congress of the United States, where -- where I've led a state that works in the great state of Indiana, and whatever other responsibilities might follow from this, I -- I would hope and, frankly, I would pray to be able to meet that moment with that -- that lifetime of experience. QUIJANO: Senator Kaine, on the campaign trail, you praised Secretary Clinton's character, including her commitment to public service, yet 60 percent of voters don't think she's trustworthy. Why do so many people distrust her? Is it because they have questions about her e-mails and the Clinton Foundation? Hillary Clinton has that passion. From a time as a kid in a Methodist youth group in the suburbs of Chicago, she has been focused on serving others with a special focus on empowering families and kids. As a civil rights lawyer in the South, with the Children's Defense Fund, first lady of Arkansas and this country, senator, secretary of state, it's always been about putting others first. And that's a sharp contrast with Donald Trump. Donald Trump always puts himself first. He built a business career, in the words of one of his own campaign staffers, "off the backs of the little guy." And as a candidate, he started his campaign with a speech where he called Mexicans rapists and criminals, and he has pursued the discredited and really outrageous lie that President Obama wasn't born in the United States. It is so painful to suggest that we go back to think about these days where an African-American could not be a citizen of the United States. And I can't imagine how Governor Pence can defend the insult- driven selfish "me first" style of Donald Trump. PENCE: Because at a time of great challenge in the life of this nation, where we've weakened America's place in the world, stifled America's economy, the campaign of Hillary Clinton and Tim Kaine has been an avalanche of insults. Look, to get to your question about trustworthiness, Donald Trump has built a business through hard times and through good times. He's brought an extraordinary business acumen. He's employed tens of thousands of people in this country. PENCE: Well, let me interrupt -- let me interrupt you and finish my sentence, if I can. Under Secretary Clinton's leadership, she was part of the national team, public safety team that went after and revived the dormant hunt against bin Laden and wiped him off the face of the Earth. She worked to deal with the Russians to reduce their chemical weapons stockpile. She worked a tough negotiation with nations around the world to eliminate the Iranian nuclear weapons program without firing a shot. QUIJANO: There are a lot of people wondering in this country about the economy. Let's turn to the issue of the economy. PENCE: I think the fact that -- that under this past administration was of which Hillary Clinton was a part, we've almost doubled the national debt is atrocious. I mean, I'm very proud of the fact that -- I come from a state that works. The state of Indiana has balanced budgets. We cut taxes, we've made record investments in education and in infrastructure, and I still finish my term with $2 billion in the bank. That's a little bit different than when Senator Kaine was governor here in Virginia. He actually -- he actually tried to raise taxes by about $4 billion. He left his state about $2 billion in the hole. In the state of Indiana, we've cut unemployment in half; unemployment doubled when he was governor. PENCE: But I think he's a very fitting running mate for Hillary Clinton, because in the wake of a season where American families are struggling in this economy under the weight of higher taxes and Obamacare andthe war on coal and the stifling avalanche of regulation coming out of this administration, Hillary Clinton and Tim Kaine want more of the same. It really is remarkable that they actually are advocating a trillion dollars in tax increases, which I get that. You tried to raise taxes here in Virginia and were unsuccessful. We can get America moving again. Put on top of that the kind of trade deals that'll put the American worker first, and you've got a prescription for real growth. And when you get the economy growing, Elaine, that's when you can deal with the national debt. When we get back to 3.5 percent to 4 percent growth with Donald Trump's plan will do, then we're going to have the resources to meet our nation's needs at home and abroad, and we're going to have the ability to bring down the national debt. KAINE: Elaine, on the economy, there's a fundamental choice for the American electorate. Do you want a "you're hired" president in Hillary Clinton or do you want a "you're fired" president in Donald Trump? I think that's not such a hard choice. Hillary and I have a plan that's on the table that's a "you're hired" plan.Five components. First thing we do is we invest in manufacturing, infrastructure, and research in the clean energy jobs of tomorrow. Second thing is we invest in our workforce, from pre-K education to great teachers to debt-free college and tuition-free college for families that make less than $125,000 a year. Third, we promote fairness by raising the minimum wage, so you can't work full-time and be under the poverty level, and by paying women equal pay for equal work. Fourth, we promote small business growth, just as we've done in Virginia, to make it easier to start and grow small businesses. Hillary and I each grew up in small-business families. My dad, who ran an iron working and welding shop, is here tonight. And, fifth, we have a tax plan that targets tax relief to middle- class individuals and small businesses and asks those at the very top who've benefited as we've come out of recession to pay more. KAINE: The Trump plan is a different plan. It's a "you're fired" plan. And there's two key elements to it. First, Donald Trump said wages are too high. And both Donald Trump and Mike Pence think we ought to eliminate the federal minimum wage. The second component of the plan is massive tax breaks for the very top, trillions of dollars of tax breaks for people just like Donald Trump. The problem with this, Elaine, is that's exactly what we did 10 years ago and it put the economy into the deepest recession -- the deepest recession since the 1930s. Independent analysts say the Clinton plan would grow the economy by 10.5 million jobs. The Trump plan would cost 3.5 million jobs. And Donald Trump -- why would he do this? Because his tax plan basically helps him. And if he ever met his promise and he gave his tax returns to the American public like he said he would, we would see just how muchhis economic plan is really a Trump-first plan. PENCE: Well, first, let me say, I appreciated the "you're hired," "you're fired" thing, Senator. You use that a whole lot. And I think your running mate used a lot of pre-done lines. PENCE: Well, this is probably the difference between Donald Trump and Hillary Clinton and Senator Kaine. And, I mean, Hillary Clinton and Senator Kaine -- God bless you for it, career public servants, that's great -- Donald Trump is a businessman, not a career politician. He actually built a business. Those tax returns that were -- that came out publicly this week show that he faced some pretty tough times 20 years ago. But like virtually every other business, including the New York Times not too long ago, he used what's called net operating loss. We have a tax code, Senator, that actually is designed to encourage entrepreneurship in this country. PENCE: His tax returns -- his tax returns showed he went through a very difficult time, but he used the tax code just the way it's supposed to be used. And he did it brilliantly. KAINE: How do you know that? You haven't seen his tax returns. QUIJANO: Senator Kaine, on the issue of Social Security, in 18 years,when the Social Security Trust Funds run out of money, you'll be 76. The Committee for a Responsible Federal Budget estimates your benefits could be cut by as much as $7,500 per year. What would your administration do to prevent this cut? KAINE: First, we're going to protect Social Security, which is one of the greatest programs that the American government has ever done. It happened at a time when you would work your whole life, your whole life, raising your kids, working, being a Little League coach or a Sunday school teacher, and then you would retire into poverty. And Social Security has enabled people to retire with dignity and overwhelmingly not be in poverty. We have to keep it solvent. And we will keep it solvent. And we'll look for strategies like adjusting the payroll tax cap upward in order to do that. Here's what Hillary and I will not do. And I want to make this very plain. We will never, ever engage in a risky scheme to privatize Social Security. Donald Trump wrote a book and he said Social Security is a Ponzi scheme and privatization would be good for all of us. And when Congressman Pence was in Congress, he was the chief cheerleader for the privatization of Social Security. Even after President Bush stopped pushing for it, Congressman Pence kept pushing for it. We're going to stand up against efforts to privatize Social Security. And we'll look for ways to keep it solvent going forward, focusing primarily on the payroll tax cap. QUIJANO: Governor Pence, I'll give you an opportunity to respond. KAINE: Go read -- go read the book. PENCE: All Donald Trump -- all Donald Trump and I have said about Social Security is we're going to meet our obligations to our seniors. That's it. KAINE: But -- but you have a voting record, Governor. PENCE: There's a question that you asked a little bit earlier that I want to go back to. KAINE: I can't believe that you won't defend your own voting record. KAINE: You're not going to cut taxes. You're going to raise taxes on the middle class. PENCE: ... reform government programs so we can meet the obligations of Social Security and Medicare. QUIJANO: Gentleman, I want to move on now. PENCE: Three hundred and five (ph) economists said your plan is bad for the economy. QUIJANO: ... to the issue of law enforcement and race relations. Law enforcement and race relations. After the Dallas police shooting, Police Chief David Brown said, quote, "We're asking cops to do too much in this country. Every societal failure we put it off on the cops to solve. Not enough mental health funding, not enough drug addiction funding, schools fail, let's give it to the cops." Do we ask too much of police officers in this country? And how would you specifically address the chief's concerns? Senator Kaine? KAINE: Elaine, I think that's a very fair comment. I think we put a lot on police shoulders. And this is something I got a lot of scar tissue and experience on. Here's what I learned as a mayor and a governor. The way you make communities safer and the way you make police safer is through community policing. You build the bonds between the community and the police force, build bonds of understanding, and then when people feel comfortable in their communities, that gap between the police and the communities they serve narrows. And when that gap narrows, it's safer for the communities and it's safer for the police. That model still works across our country, but there are some other models that don't work, an overly aggressive, more militarized model. Donald Trump recently said we need to do more stop-and-frisk around the country. That would be a big mistake because it polarizes the relationship between the police and the community. So here's what we'll do. We'll focus on community policing. We will focus on -- and Hillary Clinton has rolled out a really comprehensive mental health reform package that she worked on with law enforcement professionals, and we will also fight the scourge of gun violence in the United States. I'm a gun-owner. I'm a strong Second Amendment supporter. But I've got a lot of scar tissue, because when I was governor of Virginia, there was a horrible shooting at Virginia Tech, and we learned that through that painful situation that gaps in the background record check system should have been closed and it could have prevented that crime, and so we're going to work to do things like close background record checks. And if we do, we won't have the tragedies that we did. One of those killed at Virginia Tech was a guy named Liviu Librescu. He was a 70-plus-year-old Romanian Holocaust survivor. He had survived the Holocaust. Then he survived the Soviet Union takeover of his country. But then he was a visiting professor at Virginia Tech, and he couldn't survive the scourge of gun violence. PENCE: You know, my uncle was a cop, a career cop, on the beat in downtown Chicago. He was my hero when I was growing up. And we'd go up to visit my dad's family in Chicago. My three brothers and I would marvel at my uncle when he would come out in his uniform, sidearm at his side. Police officers are the best of us. And the men and women, white, African-American, Asian, Latino, Hispanic, they put their lives on the line every single day. And let my say, at the risk of agreeing with you, community policing is a great idea. It's worked in the Hoosier state. And we fully support that. Donald Trump and I are going to make sure that law enforcement have the resources and the tools to be able to really restore law and order to the cities and communities in this nation. It's probably -- probably why the 330,000 members of the Fraternal Order of Police endorsed Donald Trump as the next president of the United States of America, because they see his commitment to them. They see his commitment to law and order. But they also -- they also hear the bad mouthing, the bad mouthing that comes from people that seize upon tragedy in the wake of police action shootings as -- as a reason to -- to use a broad brush to accuse law enforcement of -- of implicit bias or institutional racism. And that really has got to stop. I mean, when an African-American police officer in Charlotte named Brentley Vinson, an all-star football player who went to Liberty University here in the state, came home, followed his dad into law enforcement, joined the force in Charlotte, joined the force in Charlotte in 2014, was involved in a police action shooting that claimed the life of Keith -- Keith Lamont Scott, it was a tragedy. I mean, I -- we -- we mourn with those who mourn. We -- we grieve with those who grieve. And we're saddened at the loss of life. QUIJANO: All right. I want to turn to our next segment now, immigration. Your running mates have both said that undocumented immigrants who have committed violent crimes should be deported.What would you tell the millions of undocumented immigrants who have not committed violent crimes? Governor Pence? But I have to tell you, I just -- I was listening to the avalanche of insults coming out of Senator Kaine a minute ago. KAINE: These were Donald's -- hold on a second, Governor. QUIJANO: Gentleman, I'd like to shift now to the threat of terrorism. Do you think the world today is a safer or more dangerous place than it was eight years ago? Has the terrorist threat increased or decreased? Senator Kaine? KAINE: The terrorist threat has decreased in some ways, because bin Laden is dead. The terrorist threat has decreased in some ways because an Iranian nuclear weapons program has been stopped. The terrorist threat to United States troops has been decreased in some ways because there's not 175,000 in a dangerous part of the world. There's only 15,000. But there are other parts of the world that are challenging. Let me tell you this: To beat terrorism, there's only one candidate who can do it, and it's Hillary Clinton. Remember, Hillary Clinton was the senator from New York on 9/11. She was there at the World Trade Center when they were still searching for victims and survivors. That's seared onto her, the need to beat terrorism. And she's got a plan to do it. She was part of the national security team that wiped out bin Laden. Here's her plan to defeat ISIL. First, we've got to keep taking out their leaders on the battlefield. She was part of the team that got bin Laden, and she'll lead the team that will get Abu Bakr al-Baghdadi, the head of ISIS. Second, we've got to disrupt financing networks, third, disrupt their ability to recruit on the Internet, in their safe havens. But, fourth, we also have to work with allies to share and surge intelligence. That's the Hillary Clinton plan; she's got the experience to do it. Donald Trump. Donald Trump can't start a Twitter war with Miss Universe without shooting himself in the foot. Donald Trump doesn't have a plan. He said, "I have a secret plan," and then he said, "Um, I know more than all the generals about ISIL." And then he said, "I'm going to call the generals to help me figure out a plan." And finally he said, "I'm going to fire all the generals." He doesn't have a plan. But he does have dangerous ideas. Here's four. He trash talks the military. The military is a disaster, John McCain's no hero, the generals need all to be fired, and I know more than them. He wants to tear up alliances. NATO is obsolete, and we'll only work together with Israel if they pay "big league." PENCE: We're going to put the safety and security of the American people first. QUIJANO: ... has talked about an intelligence surge. KAINE: Intelligence surge is two-thirds, Elaine. It's two things. It's, first, dramatically expanding our intelligence capacities by hiring great professionals, but also we've got some of the best intel and cyber employees in the world right here in the United States working for many of our private sector companies. But the second piece of this is really, really important. It also means creating stronger alliances, because you gather intelligence and then you share your intelligence back and forth with allies. And that's how you find out who may be trying to recruit, who may be trying to come to one country or the next. Alliances are critical. That's why Donald Trump's claim that he wants to -- that NATO is obsolete and that we need to get rid of NATO is so dangerous. PENCE: That's not his plan. KAINE: Well, he said NATO is obsolete. And, look, if you put aside -- push aside your alliances, who you're going to share intelligence with? Hillary Clinton is the secretary of state who knows how to build alliances. She built the sanctions regime around the word that stopped the Iranian nuclear weapons program. And that's what an intelligence surge means. Better skill and capacity, but also better alliances. QUIJANO: You can -- you can have 30 seconds, Governor, quickly, please. PENCE: First, Donald Trump just spoke about this issue this week. We have got to bring together the best resources of this country to understand that cyber warfare is the new warfare of the asymmetrical enemies that we face in this country. And I look forward if I'm privileged to be in this role of working with you in the Senate to make sure that we resource that effort. QUIJANO: And I don't -- 30 seconds is on up. PENCE: ... about drone strikes, e-mails from the president of the United States of America were on there. QUIJANO: I'd like to ask you about Syria, Governor. PENCE: We could put cybersecurity first if we just make sure the next secretary of state doesn't have a private server. PENCE: ... they'd be court martialed. PENCE: What we're dealing with is the -- you know, there's an old proverb that says the Russian bear never dies, it just hibernates. And the truth of the matter is, the weak and feckless foreign policy of Hillary Clinton and Barack Obama has awakened an aggression in Russia that first appeared a few years ago with their move in Georgia, now their move into Crimea, now their move into the wider Middle East. And all the while, all we do is fold our arms and say we're not having talks anymore. To answer your question, we just need American strength. We need to -- we need to marshal the resources of our allies in the region, and in the immediate, we need to act and act now to get people out of harm's way. PENCE: The -- the safe zones would have to be -- as the senator said, there's already a framework for this that's been recognized by the international community. The United States of America needs to be prepared to work with our allies in the region to create a route for safe passage and then to protect people in those areas, including with a no-fly zone. PENCE: ... is deeply troubling to me. That will all change the day Donald Trump becomes president of the United States. PENCE: I just did. KAINE: ... that it's a good thing, not a bad thing, that it's a good thing -- not a bad thing -- that we're down from 175,000 troops deployed overseas to 15,000. But let me tell you what will really make the Middle East dangerous. Donald Trump's idea that more nations should get nuclear weapons, Saudi Arabia, Japan, South Korea. Ronald Reagan said something really interesting about nuclear proliferation back in the 1980s. He said the problem with nuclear proliferation is that some fool or maniac could trigger a catastrophic event. And I think that's who Governor Pence's running mate is, exactly who Governor Reagan warned us about. PENCE: And come on. Senator. Senator, that was even beneath you and Hillary Clinton. And that -- that's pretty low. KAINE: But do you -- do you think -- do you think we should have -- more nuclear weapons in the world will make us safer? KAINE: That's what Donald Trump thinks. PENCE: ... and assurance to our allies. But let me go back to this Iran thing. I mean, he keeps saying that they prevented -- that Hillary Clinton started the deal with the Iranians prevented Iran from getting a nuclear weapon. KAINE: That's what the Israeli joint chiefs of staff is saying right now. PENCE: Well, that's not what -- that's not what Israel thinks. PENCE: You wouldn't necessarily know that. PENCE: I know you boycotted Prime Minister Netanyahu's speech when he came before the Congress. PENCE: You boycotted the speech. The point is, what this Iran -- so-called Iran deal did was essentially guarantee -- I mean, when I was in Congress, I fought hard on a bipartisan basis with Republican and Democrat members to move forward the toughest sanctions, it -- literally in the history of the United States, against Iran. PENCE: ... is astonishing to the American people. KAINE: Six times tonight, I have said to Governor Pence I can't imagine how you can defend your running mate's position on one issue after the next. And in all six cases, he's refused to defend his running mate. PENCE: Well, let's -- no, no, don't put words in my mouth. PENCE: Most of the stuffy you've said, he's never said. QUIJANO: Senator, please. This is Governor Pence's two minutes. PENCE: Look, this is the alternative universe of Washington, D.C., versus reality. Hillary Clinton said her number-one priority was a reset with Russia. That reset resulted in the invasion of Ukraine, after they'd infiltrated with what are called little green men, Russian soldiers that were dressing up like Ukrainian dissidents, and then they moved all the way into Crimea, took over the Crimean Peninsula. Donald Trump knew that happened. He basically was saying it's not going to happen again. The truth of the matter is that what you have in the rise of aggressive Russia, which has had -- increased its influence in Iran, that's now -- now because of this deal is on a pathway in the future to obtain a nuclear -- the leading state sponsor of terror in the world in Iran now has a closer working relationship with Russia because of Hillary Clinton and Barack Obama's foreign policy and $150 billion and sanctions all being lifted. KAINE: We even wiped out the leader of Al Qaida. PENCE: ... we delivered $400 million in cash as a ransom payment for Americans held by the radical mullahs in Tehran. QUIJANO: ... quote, "Putin has no respect for Hillary Clinton and no respect for Obama." Why do you think he'll respect a Trump- Pence administration? PENCE: ... who is going to lead with American strength. QUIJANO: Please, Senator, I'll give you a chance to respond. PENCE: We're going to rebuild our military. And let me -- let me -- this whole Putin thing. Look, America is stronger than Russia. Our economy is 16 times larger than the Russian economy. America's political system is superior to the crony, corrupt capitalist system in Russia in every way. PENCE: ... of Hillary Clinton and Barack Obama. PENCE: Yeah. KAINE: And with Donald Trump -- Donald Trump's sons say that they have all these business dealings with Russia. Those could be disclosed with tax returns, but they refuse to do them. Americans need to worry about whether Donald Trump will be watching out for America's bottom line or his own bottom line. QUIJANO: All right, I'd like to ask now about North Korea, Iran and the threat of nuclear weapons. North Korea recently conducted its fifth and most powerful nuclear test. PENCE: Well, first, we need to -- we need to make a commitment to rebuild our military, including modernizing our nuclear forces. And we also need -- we also need an effective American diplomacy that will marshal the resources of nations in the Asian Pacific Rim to put pressure on North Korea, on Kim Jong-un, to abandon his nuclear ambitions. It has to remain the policy of the United States of America the denuclearization of the Korean Peninsula, plain and simple. And when Donald Trump is president of the United States, we're -- we're not going to have the -- the kind of posture in the world that has Russia invading Crimea and Ukraine, that has the Chinese building new islands in the South China Sea, that has literally the world, including North Korea, flouting American power. We're going to -- we're going to go back to the days of peace through strength. PENCE: ... done well in some focus group. But here -- Hillary Clinton and her husband set up a private foundation called the Clinton Foundation. While she was secretary of state, the Clinton Foundation accepted tens of millions of dollars from foreign governments and foreign donors. PENCE: ... while she's secretary of state. PENCE: And they're saying enough is enough. KAINE: I'm going to talk about the foundation, and then I'll talk about North Korea. So, on the foundation. I am glad to talk about the foundation. The Clinton Foundation is one of the highest- rated charities in the world. It provides AIDS drugs to about 11.5 million people. It helps Americans deal with opioid overdoses. It gets higher rankings for its charity than the American Red Cross does. The Clinton foundation does an awful lot of good work. But let's compare this now with the Trump organization and the Trump Foundation. The Trump organization is an octopus-like organization with tentacles all over the world whose conflict of interests could only be known if Donald Trump would release his tax returns. He's refused to do it. His sons have said that the organization has a lot of business dealings in Russia. And remember, the Trump organization is not a non-profit. It's putting money into Donald Trump's pockets and into the pockets of his children, whereas the Clinton Foundation is a non- profit and no Clinton family member draws any salary. PENCE: The Trump Foundation is non-profit. This is the difference between a foundation that does good work and a secretary of state who acted in accordance with American interest and somebody who is conflicted and doing work around the world and won't share with the American public what he's doing and what those conflicts are. QUIJANO: Governor, I will give you 30 seconds to respond, because I know you want to, but, again, I would remind you both this was about North Korea. PENCE: ... and we'd have a much better picture of what the Clinton Foundation was about. KAINE: If we -- look, a president should take action to defend the United States against imminent threat. You have to. A president has to do that. Now exactly what action, you would have to determine what your intelligence was, how certain you were of that intelligence, but you would have to take action. You asked the question about how do we deal with a North Korea. I'm on the Foreign Relations Committee. We just did an extensive sanctions package against North Korea. And interestingly enough, Elaine, the U.N. followed and did this -- virtually the same package. Often China will use their veto in the Security Council to veto a package like that. They're starting to get worried about North Korea, too. So they actually supported the sanctions package, even though many of the sanctions are against Chinese firms, Chinese financial institutions. So we're working together with China, and we need to. China's another one of those relationships where it's competitive, it's also challenging, and in times like North Korea, we have to be able to cooperate. Hillary understands that very well. She went once famously to China and stood up at a human rights meeting and looked them in the eye and said, "Women's rights are human rights." They didn't want her to say that, but she did. But she's also worked on a lot of diplomatic and important diplomatic deals with China. And that's what it's going to take. The thing I would worry a little bit about is that Donald Trump owes about $650 million to banks, including the Bank of China. I'm not sure he could stand up so tough to the people who have loaned him money. KAINE: That's a really important one. That may be the $64,000 question, because it has been a divisive campaign. And again, Hillary is running a campaign about stronger together, and Donald Trump -- and this is -- this is not directed at this man, except to the extent that he can't defend Donald Trump -- Donald Trump has run a campaign that's been about one insult after the next. But we do have to bring the country together. So here's what we'll do. Hillary Clinton was first lady, then senator for eight years and secretary of state. And I served in the Senate. And I'm really amazed, Elaine, as I talk to Republican senators, how well they regard and respect Hillary Clinton. She worked across the aisle after 9/11 to get health benefits for the first responders who bravely went into the towers and into the Pentagon. She worked to get benefits for -- TRICARE benefits for National Guard members, including Hoosiers and Virginians in the National Guard. Because I think it's fine to be a Democrat or Republican or independent, but after Election Day, the goal is work together. And Hillary Clinton has a track record of accomplishment across the aisle that will enable her to do just that when we work with the new Congress in January. PENCE: ... tonight. Thank you, Senator. This is a very challenging time in the life of our nation. Weakened America's place in the world after the leadership of Hillary Clinton and Barack Obama on the world stage has been followed by an economy that is truly struggling, stifled by an avalanche of more taxes, more regulation, Obamacare, the war on coal, and the kind of trade deals that have put American workers in the back seat. I think the best way that we can bring people together is through change in Washington, D.C.
You know, I served in Washington, D.C., for 12 years in the Congress of the United States. And I served with many Republicans and Democrats, men and women of goodwill. The potential is there to really change the direction of this country, but it's going to take leadership to do it. And Donald Trump's entire career has been about building. It's been about -- it's going through hardship just like a businessperson does and finding a way through smarts and ingenuity and resilience to fight forward and -- when Donald Trump becomes president of the United States, we're going to have a stronger America. When you hear him say he wants to make America great again, when we do that, I truly do believe the American people are going to be standing taller. They're going to see that real change can happen after decades of just talking about it. And when that happens, the American people are going to stand tall, stand together, and we'll have the kind of unity that's been missing for way too long. From Farmville, Virginia, I'm Elaine Quijano of CBS News. Good night.